Occasionally, I like to share some of the writing assignments we give students at WriteAtHome. 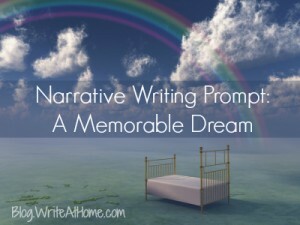 This one provides an opportunity for a little creative narrative writing. This assignment is a kind of personal narrative, only instead of being from your actual experience, it should come from a dream you’ve had. Everyone has at least one of those dreams that sticks with you long after your eyes open, right? I don’t mean a daydream or a one day I’m going to juggle in the circus kind of dream, but an actual, lights-out, head-on-the-pillow, unconscious dream. Pick one that stands out. It can be particularly weird, pleasant or frightening. It’s up to you. The challenge, of course, will be to relate the events of the dream in a way that makes some kind of sense, while giving the feel of an actual dream. This may be difficult, because dreams can be so strange: a place can be two or more places at once (your grandma’s kitchen and the top of the Empire State Building), people can meld into other people (your Aunt Ethel is suddenly Denzel Washington), and events don’t necessarily follow ordinary lines of reason (you run in fear from the dentist because…he’s eating a salami sandwich!). Anyway, have fun with this. If you are a boring dreamer, feel free to jazz it up any way you like (Who’s going to know?). In fact, you can feel free to make any changes you’d like to the dream if you think it will improve the story. If you just aren’t the type to remember dreams, feel free to make up the whole thing. Just do your best to make it seem dreamlike. Comments? Questions? Suggestions? Leave them below. Leave a Reply to custom air jordans Click here to cancel reply.